Vancouver International Airport is just 75 miles south of Whistler/Blackcomb. Non-stop direct flights to Vancouver from major U.S. cities include: New York, Minneapolis, Dallas, Denver, Phoenix, San Francisco, Los Angeles, Chicago, Houston, Boston, Atlanta and more. Airlines that service Vancouver from U.S. cities include: Canadian, Air Canada, Delta, United, American, Alaska, America West, Northwest, Air B.C., Horizon, Sky West. The 1-800 phone numbers and Web links for these carriers are available in this magazines Airlines page. Direct flights are also available from Asia, Canada, Europe, and Mexico. Most major car rental agencies service the Vancouver Airport and their 1-800 phone numbers and Web links are listed in this magazines Autos page. The two-hour drive to Whistler along the Sea to Sky Highway offers beautiful and dramatic views of British Columbias Howe Sound. 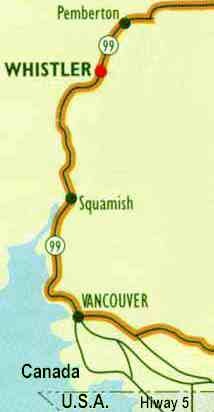 From Vancouver, take Highway 99 north, 75 miles (120 km) to Whistler. B.C Rail offers daily service between North Vancouver and Whistler. See their Web link below for more information. Bus transport is available from Perimeter Transportation, Ltd. which can be reached at 604-266-5386, or Maverick Coach Lines at 604-255-1171. Whistler Resort is divided into five areas. Whistler Village is situated at the base of both Whistler and Blackcomb Mountains. 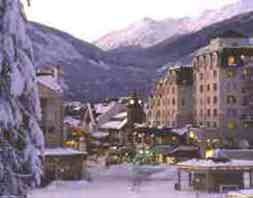 All properties are within walking distance to the lifts of both mountains. Village North is the newest developed region and offers views of side-by-side Whistler and Blackcomb Mountains. Upper Village is tucked into the base of Blackcomb Mountain and is a great "on slope" location. Whistler Creekside, an eclectic area, is located a few minutes south of the Village and is the site of the original Whistler Chair. Function Junction is 2 km south of Whistler Creekside and is mostly a local hangout. Resort lodging is varied: elegant condominiums, hotel suites, bed and breakfast inns, and hotels. From slopeside accommodations to units in Whistler Village, or on the Upper Mountain near Balckcomb, many units have fireplaces, Jacuzzis, pools, and fitness centers. Reservations are easily made through Central Reservations by calling 1-800-944-7853 in the U.S. and Canada, or by dialing 1-664-664-5625, or visit the Web link listed below. A culinary feast is waiting for you in the exceptional restaurants, bars and lounges at Whistler/Blackcomb. Asian, French, Continental, Italian, Mexican, Pub food, Thai, and fast food eateries are abundant. Heli Skiing is available through a number of outfitters. Indoor rock climbing, paragliding, racquet sports, ice skating, sleigh rides, snowmobiling, snowshoeing, and sightseeing tours are popular activities. For more information call Whistler reservations directly and they will put you in touch with the appropriate service company. Whistler Resort has its own public transit system that services the entire valley. Schedules and information are available by calling 604-932-4020. Total terrain of both mountains is nearly 7,000 acres. There are 30 lifts; 12 of those being high-speed chairs or gondolas. There are more than 200 trails, and the terrain is rated 20% novice, 55% intermediate, and 25% expert. Whistler and Blackcomb Mountains have the most advanced high-speed lift system in the world. Note that due to Whistler Resort's low elevation and location in British Columbia's coastal range, weather conditions are more variable than ski areas at higher elevations. Blackcomb Mountain: Top elevation: 7,494 feet (2,284 meters); Bottom elevation: 2,214 feet (675 meters).Three base areas: The Excalibur Village Station, Upper Village Blackcomb Base, and Excalibur Base II Station. Longest run is 7 miles. Whistler Mountain: Top elevation: 7,160 feet (2,182 meters); Bottom Elevation: 2,214 feet (675 meters). Two base areas: Whistler Creekside and Whistler Village. Longest run is 7 miles. 1997-98 Lift Prices: Tickets are honored at either mountain. Rates in Canadian currency are: Adults $55 ($42.50 US), Youth (13-18) $47, Child (7-12) $27, and Senior(65+) $47. Discounts are applied to multiple day tickets.